Can the Olympus E-PM1 entry-level Pen Mini deliver big on its promise? The Olympus E-PM1 interchangeable lens camera is the cheapest Olympus Pen so far, but does it bring enough to the table to take on its rivals? The most recent trend among interchangeable lens cameras has been to make them more user-friendly and affordable. 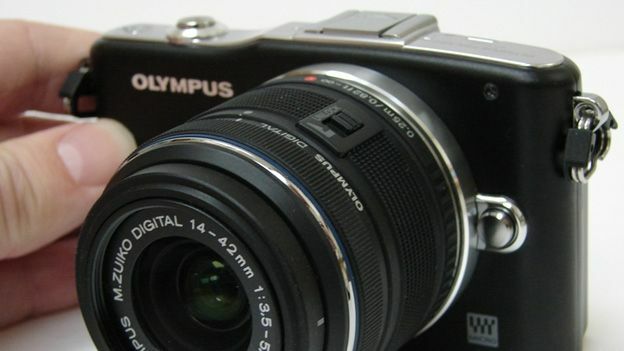 The 12.3 megapixel Olympus E-PM1 or 'Pen Mini' – the baby the family that includes the flagship Olympus E-P3 and mid range Olympus E-PL3 - is deliberately aimed at the mass-market jugular. As with a digital SLR and compact system rivals the Nikon J1, Pentax Q and Panasonic DMC-GF3, the promise is near professional image quality. So is the smallest and cheapest metal-build Olympus Pen to date, priced at £449.99, also the best option for those trading up from a smartphone or pocket snapper? Olympus sent us the black-bodied E-PM1 kit that includes an improved, quieter version of its regulation issue f3.5-5.6 14-42mm zoom. Due to the unique configuration of lens and sensor this offers the equivalent range of a physically larger 28-84mm lens on a 35mm film camera. Though the lens itself might not immediately spring to mind as a control, it does need controlling. It features a retractable locking mechanism which means that it has to be first manually extended before a shot can be taken; a screen message prompting the user to do so. Want to zoom in or out? Simply twist the lens barrel. This inevitably adds a couple of seconds onto the power up time. If the lens is already extended, however, the camera is fast to get going – ready for action in just over a second. We are sad to see that like the E-PL1 (but unlike the E-P3) the E-PM1 omits a built-in flash in order to minimise body proportions, though a small plastic clip-on FL-LM1 flash is included in the box. Otherwise controls are kept to a minimum, which means there's no dedicated shooting mode dial; instead these are accessed on screen, which is less obvious and more fiddly than we would have liked. However the Live Guide, whereby adjustments to the likes of aperture made via a simple system of sliders can be viewed in real time before the shutter fires, continues to be a nice touch. Because it's presented in widescreen 16:9 aspect ratio, the 3-inch, 460k dot resolution LCD screen eats up most of the E-PM1's backplate. This is part of the reason for the minimal array of small controls, ranged over to the right hand side of the rear plate where they fall under the thumb. It's not a touch screen nor does it employ an almost 3D-in-depth OLED display as found on the range topping and physically larger E-P3 model, nor can it be angle adjusted as on the mid range E-PL3. However, visibility is plentifully clear and we didn't have any problems composing shots indoors or out in the absence of an optical or electronic viewfinder to fall back on, not to mention the lack of any handgrip to help steady the camera. However the on-screen text is a little weedy and we had to almost squint to make out some of the features. The E-PM1 comes supplied with a BLS-5 rechargeable lithium ion battery which characteristically slots into the base and is housed in a compartment shared with a vacant slot for an optional, yet essential, SD memory card. This means that access to both is restricted if mounting the camera on a tripod. Lifespan from a full charge – charger and adapter plug bundled in box – is a maximum 330 shots. Neither fantastic or terrible. Like the other two current 'Pens' the E-PM1 is as adept at video as it is stills. It offers up Full HD 1080i video in AVCHD compression format or 720p video if opting for the more widely compatible (but less highly compressed) MPEG4 format, recording starting or stopping with a thumb press of the backplate record button. You'll get stereo sound too, which makes the fact that Olympus has cut down the noise of the lens mechanics on the latest kit zoom even more of an appeal for would-be videographers. With some lovely shallow depth of field effects available for both stills and video with the supplied zoom, colour errs on the side of natural if left on the camera's default setting, though we found it best to manually adjust colour balance if shooting without flash under tungsten light to avoid an orange-y tint. Another creative bonus is that the digital filters Olympus has provided to add some fun to stills photography, such as the HDR photography-style Dramatic Tone, colour enhancing Pop Art and Diorama (or miniature), can also be applied during video capture. Dramatic Tone proved especially useful in us soliciting some eye-catching results on otherwise grey, drab winter days. If we were to pick holes we did notice some barrel distortion shooting with the lens at its widest setting, but this is nothing unusual. For low light photography without flash we were happy with the noise-free results provided when sticking at ISO1600 or below. Pushing it upwards to ISO3200 through ISO6400, noise does start to intrude, but it has a fine grain-like appearance which we felt happy to live with. Available in black, white, silver, dark brown or purple, the Olympus E-PM1 shares a degree of retro charm with its Pen predecessors. And, while it eschews some of their built-to-last chunkiness, there will be many who prefer the more streamlined profile presented here. So while it may not be the best Olympus Pen to date – naturally look to the range topping Olypmus E-P3 for that – it is the most approachable iteration yet, offering image quality on a par with its two more expensive brethren and falling just short of an entry level DSLR. If you don't mind the pared back build, smaller typeface, non angle adjustable, non touchscreen LCD and slightly fewer digital filter gimmicks, then the 'Pen Mini' offers itself up as a mighty proposition for existing snapshot users seeking a camera that is better but not necessarily bulkier, and for a reasonable price.